Growing up just down the road from Peckham, you'd think I'd be quite knowledgeable about the area. However, back in the 1980s the area had such a bad reputation that I would generally avoid going there. This reputation came from a time where areas such as the North Peckham Estate - one of the most deprived residential areas in Europe - was at its lowest point. With unemployment high, crime was rife. I was convinced that a visit to Peckham would result in me being a victim of a robbery or worse. However, it wasn't always like that. Peckham is a saxon place name meaning the village on the River Peck. There is also evidence of a Roman settle in the area. In the Domesday book, Peckham appears as Pecheham. Later, during the 17th century, Peckham became popular as a wealthy residential area. In the 19th century the place was described as a 'small, quiet, retired village surrounded by fields'. By 1868 almost all of the fields had been used for housing so the vestry of Camberwell St Giles bought Peckham Rye to keep it as common land. However, the common was so popular on holidays that it became dangerously overcrowded. So the vestry purchased the adjacent Homestall Farm (the last remaining farm in the area) and in 1894 Peckham Rye Park opened. As the new millenium approached, all was not well. The park had suffered from years of neglect and maintenance was a low priority. In the early noughties the park was awarded a Heritage Lottery Fund grant to pay for restoration works. Sadly, shortly after the restoration works, Peckham's troubled past had again raised its ugly head in the shape of mindless vandalism of the newly restored park features. Although it is worth noting that I didn't see any signs of vandalism when I visited. The two spaces still retain their own identities; The common, which is predominately open grass, covers the northernmost section of this picturesque triangular open green space, while the park, which is laid out in a typical Victorian fashion, sits to the south. 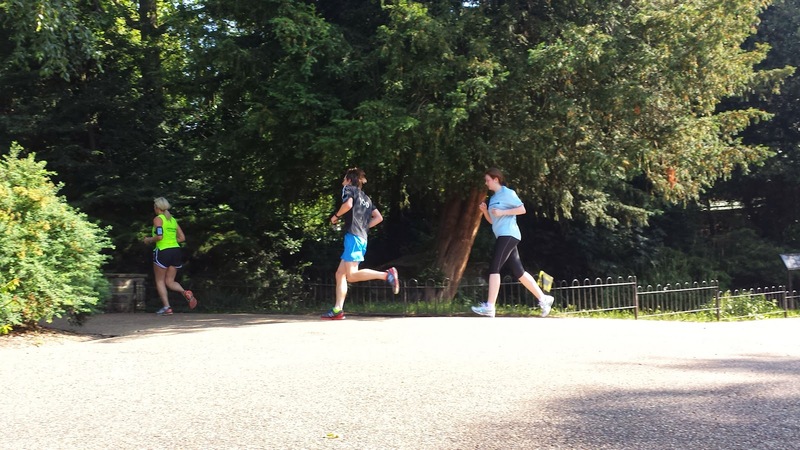 It is this southern section of Peckham Rye that provides a home to Peckham Rye parkrun, which had its inaugural event on 21 June 2014. Upon arrival, those that arrive by car can park in the small, free car park which is located just off Strakers Road. An alternative place to park is Colyton Road and the roads that lead off of it - this is actually a little bit closer to the parkrun start/finish area. However, should nature call, you'll still have to make your way across to the car park area to reach the toilets. Nearby train stations are Honor Oak Park, Nunhead, East Dulwich, and Peckham Rye. Cyclists have a few options for securing their bikes - there are bicycle racks in the car park, or if you'd prefer to keep it in sight then there are some small trees around the start/finish area that could be used. 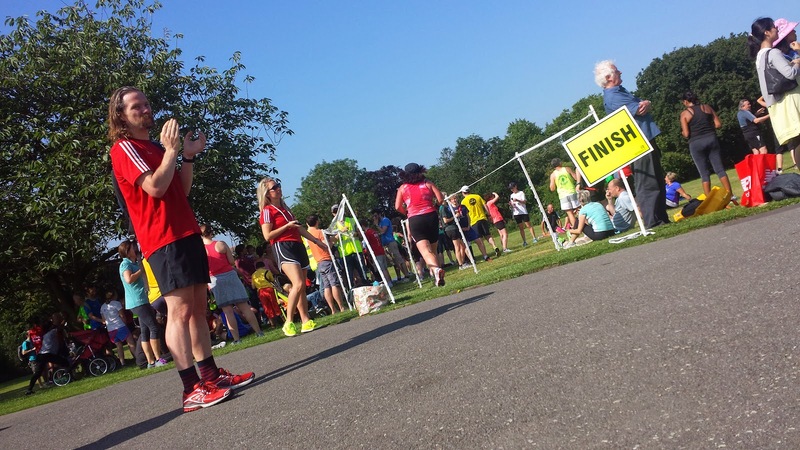 To find the start/finish area, participants need to head towards the southern end of the park where they'll find the rest of the runners, buggy runners, joggers, and walkers congregating near the 'Two Trees' crossroads. The two trees are in fact an English Oak and a Common Ash tree. The course consists of three anti-clockwise laps with a little tail which joins the loop to the start/finish area. It is 100% tarmac and it is pretty much flat except for the most gentle of gradient changes at a couple of points around the course. From the start, the runners head a short distance north along the nice wide path before bearing right when the paths divides at the picnic area & arboretum and proceed to run the three laps before, at the end of lap three, returning back down the original path to the finish. It's worth noting that at present (21 June 2014) the course map on the official page isn't exactly the same as the route we ran at the inaugural, but I'm sure the details will updated soon. The loop takes the runners past most of the park's features. The first being one of the children's playgrounds. 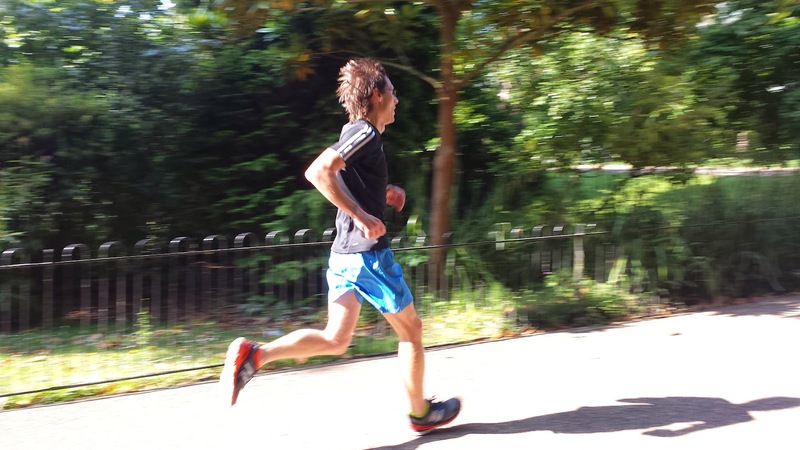 Shortly after, the runners cross the last visible section of the River Peck - the rest of the river was enclosed as the area became heavily populated and is now one of London's hidden underground rivers. The highest source of the river is a short distance to the south-east, on One Tree Hill. Here stands the Oak of Honor - This name was given to it after Elizabeth I picnicked beneath it. The current oak was planted in 1905. They then reach the perimeter path at the Homestall Road side of the park, the runners take a couple of left hand turns as they circumnavigate the adventure playground and the skate park, then follow the meandering back path and cross the River Peck again (I'd advise being cautious while crossing the bridge as there is a risk of clipping your hip on the stone wall as you turn right to join the lakeside path) where they then pass along the northern and western banks of the lake, which is home to all manner of lake-dwelling wildlife. Next up is the American Garden, and then the Sexby Garden - this was named after the park's original designer, Lt.Col. Sexby - Chief Officer of Parks to the London County Council, who served until 1910. A feature of the garden is a very old Ginkgo Biloba tree which has distinctive two-part leaves (this tree is the large one on the corner as you turn right next to the bowls green). After a couple more turns there is a bowling green to admire on the left hand side. This is followed by the Japanese shelter and the Japanese Garden (c.1908) where keen eyed runners might spot the Japanese Maple Tree complete with red leaves in the autumn and pale leaves in the spring/summer (but probably not during the run). As if that wasn't enough gardens, next up is the rockery and then the Ornamental Pond Garden. There are also so many twists and turns on this course that there is no risk of getting bored, I loved every single one! 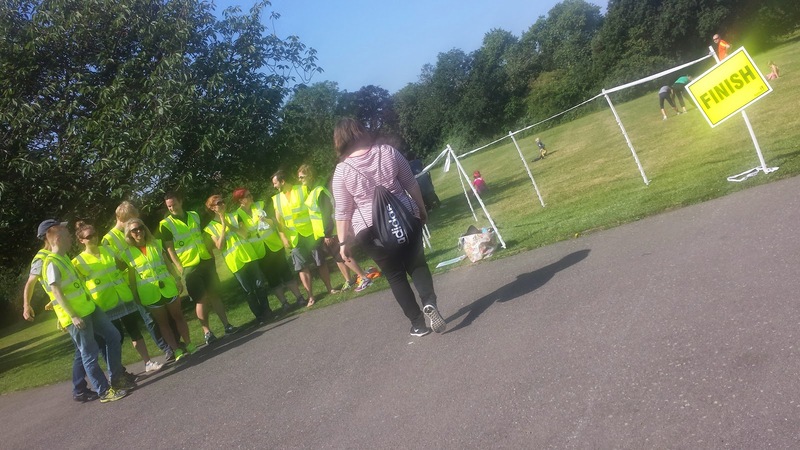 The runners then circle 'The Oval' (no, not the cricket ground, although that is only a short distance away) before heading along next to an open grass area and then coming back past a small woodland area designed to encourage wildlife. This completes the lap. As I said before, at the end of the third lap, the runners make their way back along the path where it all began, and they cross the finish line (at the inaugural event, the timing was handled by Sky Sport's Kate Riley), collect their token, take a breather, and then have their barcode and finishing token scanned in the normal parkrun way. Being a three lap course, after while the runners start to get mixed up as the faster crowd start catching up to, and lapping, the rest. So whether you're at the front or the back, it's worth trying to stay focused on what's going on around you. 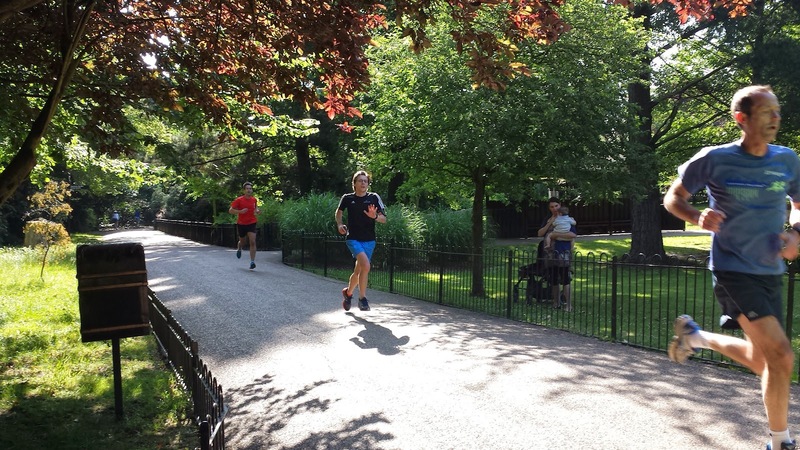 I'd avoid listening to music during the run, and of course look out for other park users - the park seems to be very popular with dog walkers, so expect to encounter a few dogs on the way around. If you are a buggy runner (like me - but not today), you'll have no problem getting around the course, but again I would pay extra attention to what's going on around you as the laps progress. After the run, there is the opportunity to have some refreshments in the cafe on the rye. I spent a while wandering around trying to find it, so for the record it is next to the car park and faces onto the Peckham Rye Common side of the park. 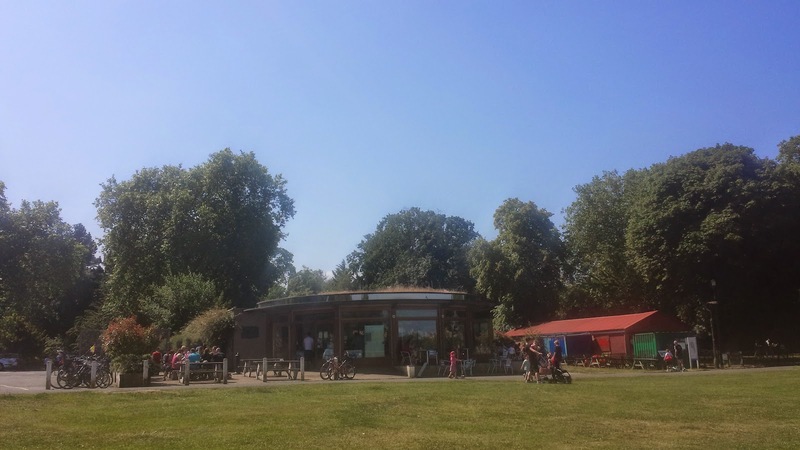 During the second world war, huts were erected on Peckham Rye Common to detain Italian prisoners of war. One of these huts still remains in the park and is next to the cafe - it is now a children's 1 o'clock club. Being an inaugural event, I bumped into a few familiar faces which was really nice. I also had some very nice compliments about the blog, so thank you for those - they really make all the effort worthwhile! the true heroes of the day - thank you! 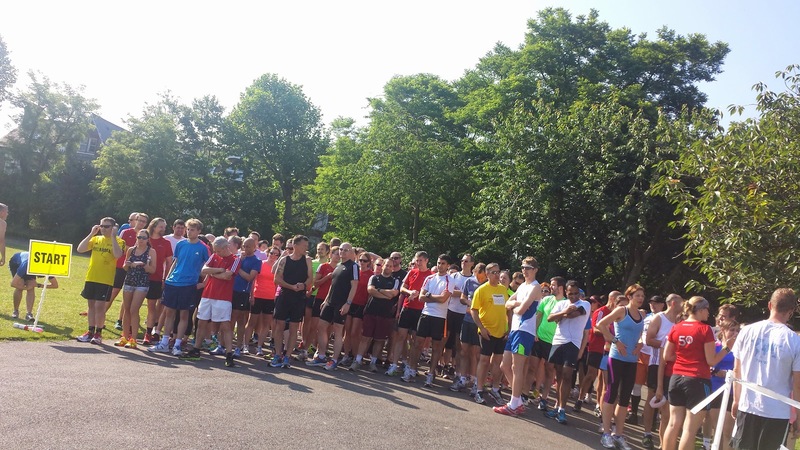 With exactly 200 runners at the inaugural event, Peckham Rye parkrun has got off to a great start (even though it is fairly compact, the park seemed to handle that number of runners fairly comfortably) and I'm sure the event is going to be an important part of the park's future. 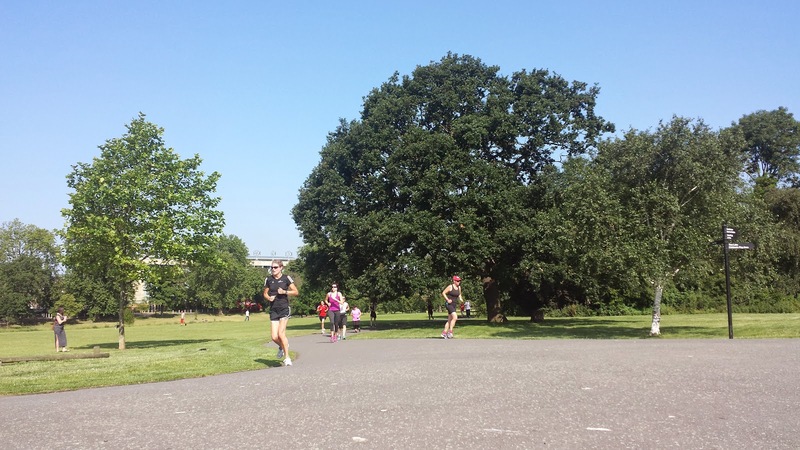 It really is a great little park which deserves to be seen and enjoyed, plus having the parkrun here gives a few more people a reason to pay it a visit. Which I urge you all to do (but not all at once, of course! ).